DO WE HAVE AN ACTUAL SHOP WHERE YOU CAN TRY AND BUY OUR SANDALS? No we don’t, for now you can only buy our sandals on our webshop. Your regular size is the right choice. We did our very best to design the sizing of the sandal as universal as possible. They’re neither bigger or smaller than the regular shoe size so we always suggest to pick your regular size. Still in doubt? 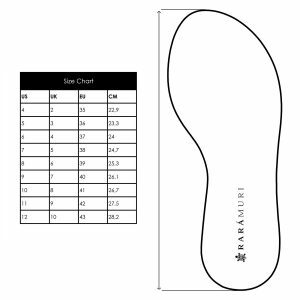 Measure your feet and check our sizing chart! IF THE SANDALS DON’T FIT, CAN I RETURN THEM FOR ANOTHER SIZE? Of course! If the sandals don’t fit, you can just send them back to us and we’ll send you a different size asap! Yes, once your order is placed you will receive an order confirmation. Once your order is shipped you will receive a track and trace code by email. CAN I WASH MY RIBBONS? Yes you can! We use high-quality fabrics for our ribbons. If they get dirty, just wash them in your washing machine (not over 40°c) and they’ll look like new! Don’t put them in the dryer or they will shrink. ARE THE SANDALS FIRM ENOUGH AROUND MY FEET? YES!!! The Rarámuri Sandals are extremely comfortable and firm on your feet. So far we only have happy and satisfied customers. The beauty of the whole concept is that you just tie them like you want t0. We’re sure you’ll find more than one way to wear your Rarámuri’s! HOW HIGH IS THE HEEL OF OUR CHILÓN MODEL? The Chilón model is 4 cm in the front and 11 cm in the back. WHAT ARE THE AVAILABLE PAYMENT METHODES?